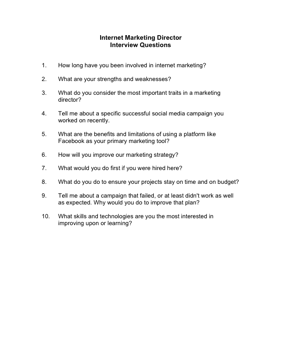 Choose your next Internet Marketing Director with the aid of these helpful interview questions. 1. How long have you been involved in internet marketing? 3. What do you consider the most important traits in a marketing director? 4. Tell me about a specific successful social media campaign you worked on recently. 5. What are the benefits and limitations of using a platform like Facebook as your primary marketing tool? 6. How will you improve our marketing strategy? 7. What would you do first if you were hired here? 8. What do you do to ensure your projects stay on time and on budget? 9. Tell me about a campaign that failed, or at least didn't work as well as expected. Why would you do to improve that plan?